On Thursday, February 2, 2017, in honor of Black History Month, LancasterHistory.org will welcome M. Alison Kibler of Franklin & Marshall College for the lecture Protests at Rocky Springs — The Integration of Lancaster’s Swimming Pools. The historic protests demanding swimming pool integration at three Lancaster pools – Rocky Springs, Maple Grove, and Brookside – are the focus of this lecture. 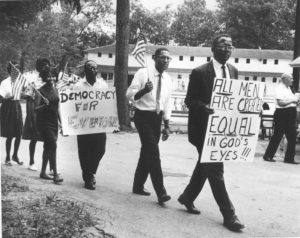 A panel discussion will follow, featuring guests who will share their recollections of the 1963 protest, including Dr. Leroy Hopkins, Rev. A.L. Stephens, Louise Williams, Nelson Polite Jr., and Attorney Robert Pfannebecker. The lecture Protests at Rocky Springs will take place on Thursday, February 2, 2017 in Ryder Hall at LancasterHistory.org, 230 N President Avenue in Lancaster, PA. A social gathering will begin at 4pm, followed by the lecture and panel at 4:30pm. The event is free and open to the public.